If the unthinkable happens, if the “never has happened before” actually happens, that’s a Black Swan event. The Federal Reserve expects faster growth and lower unemployment in 2018 as the U.S. economy strengthens. Given how healthy the economy looks, the central bank has lifted its benchmark interest rate a quarter point to a range of 1.25 percent to 1.5 percent. Investors don’t seem at all worried about a looming collapse. That sets the stage for Black Swan disruption. Reuters reports that strategists at Danish bank Saxo Bank have drawn up a list of “10 outrageous predictions” for next year which, if even one were to play out, would be a shot heard round the world. 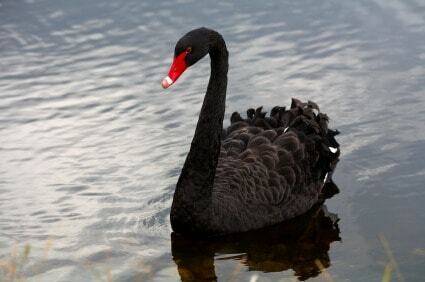 The ten possible black swans are described as extremely low probability/high-risk events. One possible Black Swan is being predicted for 2018: women could gain corporate power as CEO is more than 60 Fortune 500 companies. The 10 possible Black Swans is excerpted from from Reuters’ Factbox: Bold calls and Black Swans – how 2018 may surprise you. 1. The Fed loses independence as the U.S. Treasury takes charge, enacting a 2.5 percent cap on the 10-year yield after a massive spike higher. 2. The Bank of Japan loses control of its monetary policy. Dollar/yen (currently 113.00) rises to 150.00 and then collapses to 100.00. 3. China issues a yuan-denominated oil futures contract. The “Petro-renminbi” surges, with dollar/yuan (currently 6.61) sliding below 6.0. 4. Volatility spikes on a sudden S&P 500 ‘flash crash’, and the S&P 500 drops 25 percent in a spectacular plunge. 5. U.S. voters push left in the 2018 mid-terms, bond yields spike, with the 30-year Treasury yield (currently 2.77 percent) rips beyond 5 pct. 6. “Austro-Hungarians” launch a hostile EU takeover, as the divide between old/core EU members and more skeptical/newer members widens to an “impassable chasm”, shifting the center of gravity away from the Franco-German axis. The euro (currently $1.18) slides towards parity with the dollar at $1.00 after hitting new highs above $1.60. 7. Investors flee Bitcoin as governments strike back against the largely unregulated crypto-currency. Bitcoin (currently $16,500), plunges to $1,000. 8. South Africa booms after an “African Spring”, and the rand soars 30 pct versus emerging market currencies. 9. Tencent topples Apple as the most valuable company in the world. Tencent shares gain 100 percent. 10. Women take the reins of corporate power. More than 60 Fortune 500 companies end the year with female CEOs. Of the 10 possible Black Swans, women gaining corporate power looks pretty encouraging until you do the math. Women make up half the population. The Black Swan prediction is that women will become CEOs at 12% of the Fortune 500. That paltry 12% is double the number we have today. Doubling has never happened before. That’s what makes it an unthinkable, completely unexpected Black Swan. For more on Women in the workplace, check out our wish for 2018 The Silence Breakers Bet the Pay Raisers.